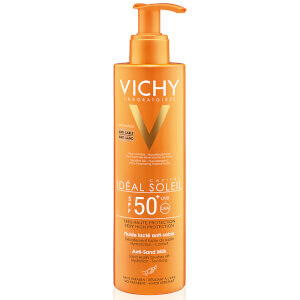 Shield skin from the sun’s harmful rays with Vichy Ideal Soleil Anti-Sand SPF 30; a protective sun cream with a velvety, non-sticky formula. The SPF30 lotion combines broad spectrum UVA and UVB filters with sensorial textures to ensure a gentle yet effective product that is suitable for all skin types, including sensitive skin. Fortified with a soothing dose of Vichy Mineralising Water, the water-resistant formula delivers a veil of moisture to skin, which keeps skin hydrated and helps to shield it from free radical damage caused when exposed to the sun. The lightweight texture effortlessly absorbs into skin without leaving behind a greasy residue and ensuring an ultra-dry finish, which allows sand to be easily brushed off. Ideal for enjoying a day at the beach the Anti-Sand SPF leaves skin smooth, dry and protected. Apply just before exposure to sun. Reapply frequently and generously to maintain protection, especially after swimming, perspiring or towelling. Avoid contact with fabrics. Aqua/Water, Dicaprylylether, Homosalate, Octocrylene, Dimethicone, Ethylhexyl Salicyclate, Nlyon-12, Styrene/Acrylates Copolymer, Butyl Methoxydibenzoylmethane, Dicapryl Carbonate, Methyl Methacrylate Crosspolymer, Cyclohexasiloxan, Polyglyceryl-6 Polyricinoleate, Drometrizoletrisiloxane, P-Anisic Acid, Caprylyl Glycol, Disodium Edta, Peg-32, Peg-8 Laurate, Phenoxyethanol, Poly C10-30 Alkyl Acrylate, Sodium Chloride, Tocopherol, Parfum/Fragrance. I really liked this lotion but bought it for my husband as he needs a higher spf than me. Unfortunately his skin reacted very badly to it, he had blistering on his neck and a really bad outbreak of lumps and bumps on his legs after using it. Anti histamine tablets and cream were required whilst on holiday and sadly it has taken weeks to clear up. I wouldn’t buy again or recommend for sensitive skin. On a positive note, it smells lovely and is very light in texture. Great sunscreen and not sticky! It was the first time I tried a 'not-sticky' sunscreen and I really liked it. Feels very smooth on the skin and offers good protection - and does what it says.